Provost Helen Carmichael cut the ribbon to signify completion of the raining stairs development. 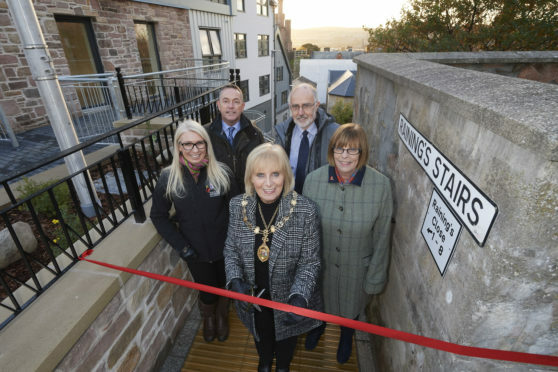 Provost Helen Carmichael has opened the doors to more than a dozen new homes as part of the transformation of one of the city’s landmark areas. The Raining Stair development features 16 new one and two bedroom flats as well as a small retail unit, with six available at an affordable rent and the remaining 10 being leased under a mid-market rent from the Highland Housing Alliance. The redevelopment of the former derelict land, which was named after John Raining, the founder of the school which was built at the head of the Stairs in 1747, was part of the city region deal. Funding for the venture was provided by The Scottish Government, Highland Housing Alliance and The Highland Council.